Russia and China have begun the construction of a new gas pipeline linking the countries, with a ceremony in the Siberian city of Yakutsk. China's CNPC has agreed to buy $400bn (£240bn) of gas from Russia's Gazprom. 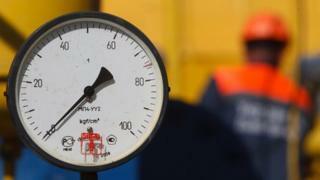 Russia will ship 38 billion cubic metres (bcm) of gas annually over a period of 30 years. The deal will lessen Russia's dependence on European buyers, who have imposed economic sanctions because of the crisis in Ukraine. The construction ceremony was attended by Russian President Vladmir Putin and Chinese Vice-Premier Zhang Gaoli. China will start work on the construction of its side of the pipeline in the first half of 2015, Mr Zhang said. The first gas will be pumped from Siberia to north-east China in early 2019. Over the past 10 years, China has used other gas suppliers. Turkmenistan is now China's largest foreign gas supplier. Last year, it started importing piped natural gas from Myanmar. China is Russia's largest single trading partner, with bilateral trade flows of $90bn (£53bn) in 2013. The two neighbours aim to double the volume to $200bn in 10 years.